When WindEnergy Hamburg opens its doors to industry visitors from around the world on 25 September, the exhibition halls will be a global stage for the novelties and the innovative impetus of this fast-growing industry. More than 1400 exhibitors from 40 countries will showcase their products and services at the world’s leading expo for wind energy. Wind turbines are the largest and among the most complex rotating machines known in the modern world. For offshore, the pace of turbine scaling is accelerating from 7 – 9.5MW sizes currently towards 12MW+ ratings and record 220-metre rotor diameters. Large-scale onshore turbines rapidly approach the 5MW ‘boundary’, whereas the 4MW low-wind Lagerwey L160 LP4 turbine model with 160-metre diameter announced for 2019 will represent the next but very likely only temporary rotor size record. For reference ? a rotor this 160m size sweeps an area of 20,106 square metres. WindEnergy Hamburg represents the ideal setting for leading onshore and offshore turbine suppliers to showcase their latest technology and product advances, with multiple ground and record breaking turbine and main component announcements expected. WindEnergy Hamburg takes place in parallel with the global WindEurope Conference, and both top events jointly form the Global Wind Summit 2018. Key drivers behind these breath-taking scaling and other product developments in the introduction of auction systems across the world, and the increasing competition from other renewables especially photovoltaics. Key enablers are parallel advances in many areas ranging from the development of new generations very long single-piece blades to new compact gearboxes, direct drive generators, high towers, in transport-logistics, and installation methods/technologies. Among new or upgraded onshore turbines presented at WindEnergy Hamburg are Enercon’s 4.2MW E-138 EP3 E2 (initially 3.5MW), and the 4.5MW Siemens Gamesa SG 4.5-145 upgrade (was 4.2MW). 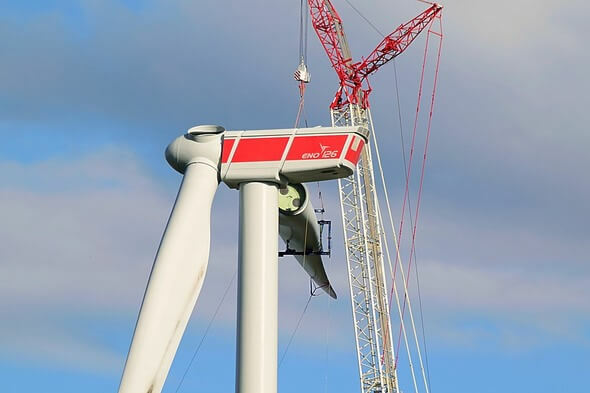 Senvion introduces its 2.3MW 2.3M130 with 130-metre rotor for low-wind, which forms part of the 2.XM turbine platform and technically builds on the proven 2MW MM series. Ming Yang of China comes for the first time to WindEnergy Hamburg and will showcase its latest three-bladed turbine models for both onshore and offshore; the company’s previous models from 3MW onwards were two-bladed. The growing importance of floating wind for offshore projects in deep-water areas is reflected by pioneers with a presence at the world’s leading expo for wind energy, like Dutch foundation developer GustoMSC offering semi-submersible structures for both horizontal-axis and vertical-axis turbines. Full floating turbine system developer aerodyn-engineering will explain visitors on the testing results in Japan with the scaled SCDnezzy 6.0 turbine and other intermediate steps towards realizing its radical 15MW twin-rotor SCDnezzy2 concept. A rapidly increasing wind industry focus is at smart turbines, and all leading suppliers incorporate systems ‘intelligence’ in their installations through sensor-based solutions in (main) components and systems. Some key examples are ‘intelligent’ control for reducing loads, turbine condition monitoring, and different operating modes like for maximizing yield and revenue for a shorter period or instead lower yield levels plus elongated turbine lifetime. WindEnergy Hamburg exhibitor Bachmann Monitoring offers a new Blade Unbalance Calculator plug-in to Bachmann’s Condition Monitoring System, which provides wind plant operators with ‘inexpensive’ regular updates on their turbine blade’s balance condition. Bearings of different sizes are critical rotating elements found at many locations in wind turbines. Bearing supplier SKF will highlight details of its Sven Wingquist Test Center where large bearings up to 6m outer diameter can be tested under realistic operating and extreme load conditions. Bearing specialist and WindEnergy Hamburg exhibitor Schaeffler has developed a highly-integrated compact sensor bearing called VarioSense, which is part of its future-oriented “Agenda 4 plus One” program. The bearing makes multiple sensor signals available for machine and process monitoring. The first VarioSense standard deep-groove ball-bearing based version is in test phase, and cylindrical and tapered roller types in development. Schaeffler says that when designing digitalizing components, rolling bearing generally represent an ideal ‘measuring point’ for recording operating loads, process parameters, and machine condition. They will explain visitors on how integration of sensors, actuators, controllers and software enables innovative functions and business models plus increased availability of machines and equipment and processes optimizing. Germany’s Eolotec developed an innovative condition monitoring solution for pitch bearings. This sensor-based Blade Bearing Guard (BBG) enables permanent wear monitoring and updates operators on bearing condition. “Before BBG market entry earlier this year, we had installed several prototypes with now over 1.5 years running experience. Any new system added expands the database and enhances overall systems ‘intelligence.’ Operators can view actual measurements online and our experts will provide visitors insight in BBG features and benefits and during WindEnergy Hamburg”, explained managing director Wolfgang Losert. Turbine upkeep and lifetime extension is another main WindEnergy Hamburg theme, because the operational phase has major impact at overall LCOE-based performance. Large-bearing specialist IMO developed a Retrofit Kit for prematurely failing four-point pitch bearings in 2 – 3MW class turbines. The solution is based on IMO’s patented T-Solid product family, OEM independent, and tailored to individual requirements. The first operational experiences will be highlighted. US/Austrian wind turbine developer AMSC in another example presents a patented yaw system alignment solution and a new control system, each focused at older multi-brand platforms. Offshore wind projects continue to increase in size and complexity. This represents major overall challenges to leading turbine suppliers, foundation manufacturers like EEW and SIF, service providers and ports and offshore wind installation contractors alike. “WindEnergy Hamburg is a prime event where we meet international offshore wind professionals, and among others display a scale model of our upgraded installation vessel Aeolus refitted with a 1,600-tonne crane for handling the latest generation foundations and turbines. Our in-house developed FaunaGuard is an acoustic device that temporarily deters marine fauna from marine construction sites, and our experts explain visitors on noise mitigation techniques that minimise installation impact”, said managing director Van Oord Offshore Wind, Arnoud Kuis. Another world novelty is Refase™ (Remote Fault Sensing), a development by UK start-up Synaptec, which uses existing fiber optic cables for sending and reflecting light along one of dozens of optical fibers available inside subsea power cables. Refase™ can reach 100km out to sea and recognizes faults in a specific cable. Synaptec experts will explain the principles and benefits to WindEnergy Hamburg visitors and especially how it could result in significantly reduced offshore O&M response times, repair costs, asset damage and income loss. German engineering consultancy Spitzner Engineers introduces a patent-pending product development called ‘Blancair’ at WindEnergy Hamburg. According to the exhibitor, the overall solution ‘generates clean energy and cleans the air simultaneously, which reduces the CO2 content in the atmosphere while operating economically by improving wind turbine efficiency.’ The innovation will be presented at a closed event to representatives from industry and finance on Friday, 28th September. More specific information will be made available at that time.